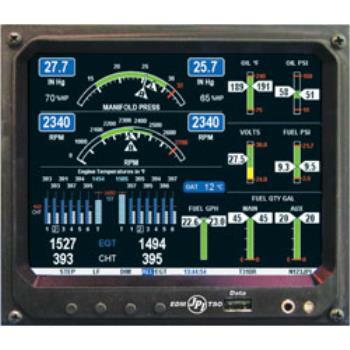 This product takes the best from the EDM-760 and adds total engine display monitoring including Tach, % Horsepower, Hobbs, Manifold Pressure, EGT, CHT, Oil Pressure, Oil Temp, Fuel Flow, Outside Air Temp, Volts, and Amps plus optional Fuel Pressure, Fuel Quantity, and Turbine Intlet Temp. As with the popular EDM-700 and EDM-800, the EDM-930 has internal memory that records all engine parameters that can be displayed on your computer to keep track of the health of your engine as well as warnings for shock cooling and excess temperature differentials. With a Size of 5.1" x 5" x 2" and weight of 2.6 lbs, the EDM-930 is the latest graphic engine analyzer from the JP Instruments. 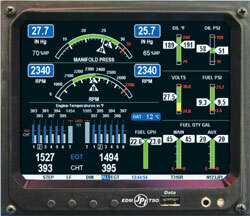 Each individual engine display has a variable scale and alarm limit to fit your particular airplane.